The Cerutti Mastodon Site and the Elephant in the Room « Comics! Games! Anthropology! One of the joys of being an anthropology instructor is that I am constantly in the stream of science news that regularly changes what we know about humans past and present. Sometimes news of research findings add a little interesting information to what we knew before. Other times, the news completely changes how we view our history and prehistory. One find of the latter category made waves in April of 2017 with the announcement that humans may have been in North America for over 100,000 years longer than previously thought. Digging further into this monumental change in our past, I was surprised to hear that the find and research organization were both local. The evidence of this deep human occupation of North America came from San Diego County and was excavated by the San Diego Museum of Natural History, led by Tom Deméré. Called the Cerutti Mastodon site, the evidence of very ancient humans consist of worn stones that appear to have been intentionally used to break associated mastodon bones. The similarities between the Cerutti Mastodon with another tale from archaeology, the Folsom Site discovery, was not lost on anthropologists. In 1926, excavation at Folsom found the bones of an extinct bison with a clearly human-made stone point embedded in the same hardened matrix. This tangible evidence confirmed that people lived in North America at the same time as animals that went extinct over 10,000 years ago, pushing the widely accepted date of this event thousands of years into the past. The Folsom discovery would have been less convincing if the stone point and the bison bones were further cleaned up and separated. Being together and viewable to skeptics made the conclusion derived from it inarguable. The San Diego Museum of Natural History did the public and science a huge favor by publicly showing key items from the Cerutti Mastodon site. Being a skeptic based on what I read online about the site and its interpretation, I made visited the museum to see these important objects for myself. There was a new installation front-and-center in one of the building’s foyers, replacing an interactive globe. 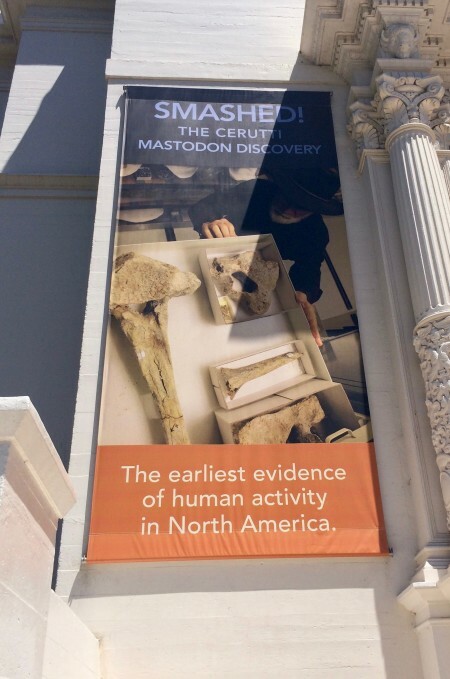 While the exhibit was advertised outside by a huge banner, I did not see the exhibit get any other visitors. Maybe the importance of what the SDMNH had found was lost on the general public that has no point of reference on how long scientists think people have been in the Americas. This meant that I had the whole section to myself to take everything in. The exhibit had several cases of recovered items, wall-mounted displays with text and illustrations, as well as a video on loop. 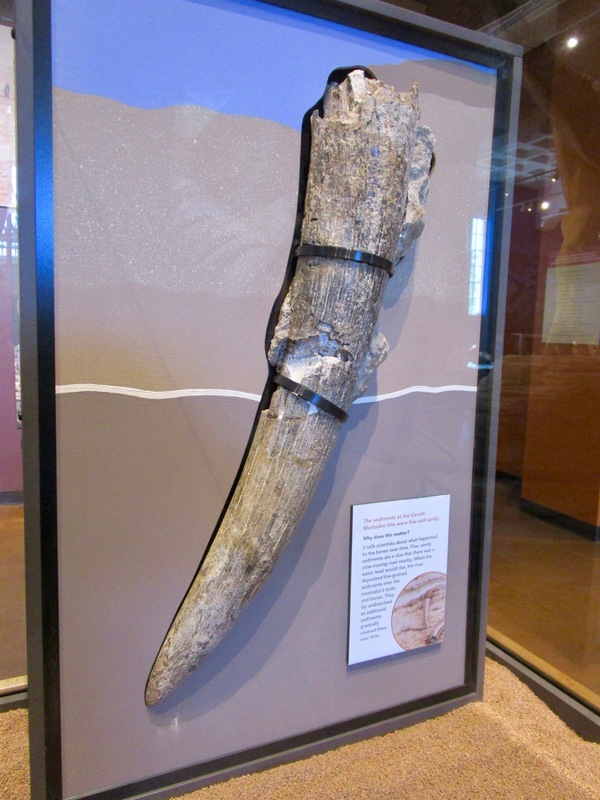 The first eye-catching object is a section of tusk that is mounted vertically on a free-standing display to simulate how it was found. The display emphasizes the looseness of the soil and that the tusk must have been purposely placed vertically instead of being naturally propped up. Past this, a case contained the unusually bisected femoral head of a mastodon, with a plaque showing their unusual context amongst other bones. Another case had the most controversial of the discoveries: the stones that show wear against the nearby mastodon bones. In person, the stones are larger than I imagined, exceeding the size of a typical human head. Plaques point out the signs of wear and their significance in the interpretation. 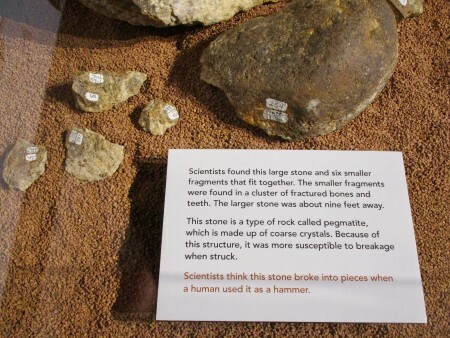 The fourth case had more stone and bone fragments, explaining how the researchers achieved the same looking results by using large stones as hammers on bone. Having made a semi-circle around the area, the last display I encountered had a video summary of the site and presented information on the dating of the objects. Each section had several plaques with very clear writing that explains to visitors what is notable and interesting about each object. As I perused the exhibit, I thought over what the researchers presented and their interpretation. Some conclusions are very solid: a tusk fragment was found vertically in loose sediment, other bones are found in odd positions, the objects date to over 100,000 years ago (though see Andrew Millard’s blog post “Extraordinary claims require extraordinary evidence“), and the mastodon bones and stones are associated and not deposited separately. Despite the surface similarities with the Folsom discovery, the Cerutti site presented less absolute evidence of human occupation. I am definitely treading on ground worn by other skeptics, but seeing the items and the presentation of interpretation myself, I noted signs that the stones were not human-manipulated artifacts. They were large and unworked, dissimilar to any post-Homo habilis stone tool style. The breaks in the bones do not correspond with the usual places to butcher bones. I think another mastodon created the Cerutti Mastodon site. While hard to imagine the whys of a mastodon picking up large rocks and breaking another mastodon’s bones, as well as sticking a tusk fragment vertically in the sediment, this interpretation fits everything found at the site and involves an organism that indisputably lived at that time and place. We will see whose interpretation bears out with more evidence. 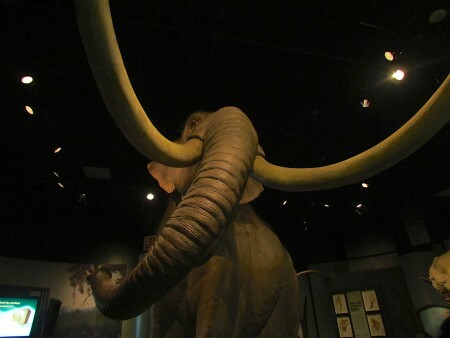 In the meantime, I highly recommend visiting the San Diego Museum of Natural History to see the Cerutti Mastodon and the many other interesting exhibits. Your mastodon scenario requires a very angry mastodon who knew how to recreate an old world style archaeological site to fool mankind! Not every archaeological site requires a fluted point to prove that it is indeed an archaeo site.